An emergency room visit without insurance is a stressful situation for anyone. Spending more than nine hours waiting to be seen by a doctor for an eye injury and then being transferred to another hospital for emergency surgery is the stuff nightmares are made of. After a hospital visit in early May, the bills for University of Central Missouri studio art major Nina Gann neared $30,000. The amount is an intimidating total, but Gann’s brother-in-law suggested launching a crowdfunder via Indiegogo to help her raise money for her bills. As a teenager, Gann worked on sets painting and doing construction. Both of her parents went to UCM so she moved to Warrensburg to pursue a major in studio art and a minor in theater. While attending UCM, she and her brother ran the 400 Club on Pine Street for a few years and she took up cooking. Gann said she became interested in the presentation and plating of the food and focused more on cooking than school. She started cooking in Kansas City and got offered a job where she could pursue a career as a chef. But like all things, Gann’s five-year tenure as a chef came to an end. “I wanted to be an executive chef at this specific restaurant, and I did it, so I wanted to move on and try other things,” Gann said. Gann headed to Clearwater Beach, Fla., last October, but something just wasn’t right about her time in the Sunshine State. After she returned to Warrensburg, Gann was renovating her house while deciding between Portland, Ore., and Kansas City as potential places she wanted to work. Part of the renovations included cleaning storm windows that were full of spider webs and dirt. Gann said she got to the last one after a long day when it fell and hit her on the head. Gann said she climbed off the ladder, hoping she didn’t cut herself. Luckily she had her sunglasses on top of her head and they absorbed the brunt of the window, or her head could have been cut by broken glass. “I was feeling around hoping I didn’t cut myself but felt around and had blood on my hand,” she said. Gann went into the house to let her friends know she had hurt herself. She said they had mixed reactions to the cut on her face because of blood that was spilling down her arm. She had her hand over the cut – when she pulled it away and showed them they debated whether she could mend the cut herself or should seek medical attention. After about 15 minutes, Gann said she decided to head to the walk-in clinic in Warrensburg instead of the emergency room. “I knew I had to go. I didn’t want a scar because I didn’t get a stitch,” she said. Gann said it was a quick trip in and out of the walk-in clinic. She showed a man at the desk her cut and they immediately told her to head to the emergency room at Western Missouri Medical Center in Warrensburg. That’s where the nightmare began. “I didn’t want to alarm anyone so I was very nonchalant (about the cut),” she said. “I texted my brother-in-law Chris (Moeller) but he was in Kansas City. About 15 minutes later my sister and mom showed up freaking out. I started to become aware that (my eye) hurt way more than it should for a little cut on my face and I felt really weird. “Nina is a tough girl, and for her to say that she’s in pain, like a seven on the pain scale is like a 12 on someone else’s scale,” said Gann’s sister Eva. Gann said as she was waiting her mother became concerned because she has a tendency to downplay everything and asked if her daughter could have a painkiller. Gann said her spirits were still up and she was joking around so she wouldn’t freak out her family. They didn’t give her anything for her pain and the nurses admitted to her one of the scariest things someone waiting to be seen by emergency room staff can hear. “Specifically, the nurses told me multiple times they forgot I was even there,” she said. Gann said she thinks her lack of insurance impacted her visit. Once the nurse found out she was a self-paying patient, Gann said the nurse told her they weren’t going to do any tests even though the window hit her in the head. While she didn’t wait the entire night, Gann’s sister Eva was alarmed for her sister. Gann said it was another two hours of waiting for the nurse to come back and her pain level was rising. “Smiles were fading,” she said. “It happened at 4 p.m. and at this point it was 10 or 11 at night and they still hadn’t done anything, no stitches or painkillers. So (the nurse) comes in and is like, ‘you ready to get out of here? Let’s get you sewn shut.’ And I asked if she was going to numb it. And she said ‘no you’re only going to need like one stitch and you’re self-pay.’ They kept saying ‘you’re self-pay.’ Like that explains everything – why we’re going to sew you shut with no painkillers. They gave me four stitches with no painkillers. It was horrible. As soon as she was done, I started vomiting everywhere. “Without anyone knowing it because no one did any tests, while she was sewing me up she was shoving the glass further in by putting pressure on it. She was actually shoving the glass into my optic nerve, which means she could have cut my eye out. She pulled out one of the stitches and redid it because she messed it up. And they were huge black jagged stitches with my face squeezed into them. It was going to leave a hideous scar. After Gann received the stitches, she said she went to bathroom because she thought she was going to vomit and became dizzy. She said the nurses were getting mad at her while she was getting sick. At that point Gann said she requested a CAT scan regardless of the cost. Gann said she hadn’t seen a doctor the entire visit, with a nurse taking care of her stitches. “At this point I had never seen a doctor, all I talked to were nurses,” she said. “All of a sudden this guy comes in, probably a half hour after the CAT scan, and he’s sweating and shaking. He introduced himself and asked if I ever had any ocular surgery, brain surgery, all these surgeries. I told him I had my wisdom teeth removed. “He said while I wait we’re going to get a nurse in here to hook you up with some morphine. At this point I had been in the emergency room for nine hours and I hadn’t gotten so much as a Tylenol, but they’re going to give me morphine. They haven’t told me anything else. And he said to do my best not to move. He kept looking at me like I’m a lab rat or something. Gann said the painkillers she was given were making her nauseous and had little effect on her pain level. When the doctor returned, he informed Gann she was headed to St. Luke’s Hospital in Kansas City and that they were calling in the head of every department to work on her surgery. She said it was a bit disconcerting because she didn’t know how big the glass was. Her doctor gave her the option to ride with her mother to the hospital or ride in an ambulance. During the ambulance ride, Gann’s head was strapped down and she was advised to not move her head or eyes. She said she didn’t even try because every time she moved them it resulted in excruciating pain. She arrived at St. Luke’s at about 3 a.m. and the hospital’s doctors were all lined up waiting for her. Gann said that as she was being prepped for surgery, she still thought there was merely a tiny piece of glass behind her eye. She said she thought it was scary but the staff at St. Luke’s would simply go in and get it. Lyon finally revealed the size as they were anesthetizing her for surgery. Gann said the only good thing about her visit to the hospital in Warrensburg was the vague nature of the revelation there was glass behind her eye. “If they told me (the size of the glass) earlier I don’t know what I would have done,“ she said. Gann with the 1.25″ x .25″ piece of glass that was behind her eye. Representatives from both Bothwell Regional Health Center in Sedalia, Mo. and Lee’s Summit Health Center declined to comment on the specifics of Nina’s visit. They both mentioned EMTALA, which is the Emergency Medical Treatment & Labor Act enacted by Congress in 1986. It ensures public access to emergency services regardless of their ability to pay. Dave Dillon, Vice President of Media of the Missouri Hospital Association, mentioned EMTALA as well. Dillon expanded on the bill, saying it is essentially a requirement to establish what condition patients are in and stabilizing them no matter who they are and what their payment circumstance is. When it comes to the payment side of the equation, Dillon said every hospital should have a written policy regarding payment available to everyone who’s admitted or seeks treatment at a hospital. Jennifer Koepke, director of quality and risk at WMMC, agreed with Dillon. “Our emergency room sees patients regardless of their payment methods. A physician or an advanced treatment nurse would give a diagnosis and assessment and then assign the necessary treatment,” Koepke added. Gann said the pain was unbearable, especially during her recovery. She said the surgery began around 4 a.m., 12 hours after the accident. Gann’s recovery hasn’t been exactly what she expected. She said she figured once her eye healed from surgery she would be back to normal. “During the first month I had no feeling on the right side of my face,” she said. “I could smack it and hear it but not feel it. My smile didn’t work on the right side of my face like I had a stroke or something. During the second month it started to tingle. Now it pretty much always hurts and I’m just used to it. The first month was awful. I was in constant pain, like, in your dreams you’re still in pain. She said the first time she went to see Lyon after the surgery was the following week. Through multiple visits, her eye hadn’t opened and he suggested she wear an eye patch all the time while it heals. She said Lyon told her when she thinks of a time frame for her recovery to think in months instead of days and weeks. In the meantime, Gann looked online for eye patches but couldn’t find anything appealing so she and her sister started making eye patches. Gann wears her patch at all times except when she showers. She said without it she gets dizzy because of the light sensitivity. Her eye remains half open most of the time but she has to keep the patch over it because of the impact on her vision. She said she even wears it while she sleeps because of how sensitive her vision is. Without the patch she wakes up to dizzying pain. During a doctor’s visit in July, Gann found out her eye was stuck aimed off to the right. She said tests revealed she still has perfect vision in the eye, yet the doctor told her it would be six months to a year before it’s fully healed. Once the healing process is over Gann said she will need at least one surgery to reconnect the damaged muscle and be back to normal. “My eye has to plateau, so it’ll be months before another surgery happens,” she said. “I can’t go in until it stops getting better. When the nurse at (Western Missouri Medical Center) was sewing my face shut she shoved (the glass) into my optic nerve. My eye muscle unattached from my eye and wrapped around the glass to protect the eye. Because of that, they had to cut out pretty much all of the muscle, so that’s where the damage is. If they could have just slipped the glass out it would probably be healed by now. Her next appointment is a week after the Indiegogo fundraising ends in early September. The idea for the Indiegogo site started with Moeller and Gann’s roommate, Paul Joyner. At first Gann was apprehensive about launching the site because she said it felt like begging. Moeller told her it would be selling her art to raise the money for her medical bills and she warmed up to the idea. Gann’s reluctance for launching the site came because she didn’t want pity or to annoy anyone with posts to social media asking for money. She said she wanted people to feel like they are getting an exchange for donating. Gann had created a solid following on social media, based on the randomness and humor of her tweets and Instagram photos. The Indiegogo page launched July 29, and the response has been staggering. Thus far, the site has raised more than $21,000. When someone donates, there are specific perks they can receive based on the dollar amount. The perks range from a virtual high five for donating $1 to a custom painting up to 50 inches for donating $3,000. Another 84 donors have claimed the $35 dollar perk, an “I saved Nina’s Eye” shirt which have an estimated delivery in November. Gann said the one person who has claimed the $3,000 was a guy she’s never met. He stumbled on the Indiegogo and decided to help out, because he had never donated to anything of this nature before. Gann said she and her counterparts on the campaign decided on the goal based on her current medical bill from St. Luke’s. Any extra money will go to future medical bills first, and help her cover expenses because she hasn’t been able to work since the accident. Through it all, Gann is finding the positive. Many people have reached out to help and support her. Some have given suggestions of potential insurance providers that will cover future surgeries with her pre-existing condition. People have donated items such as the T-shirts for her campaign, and others have offered items such as skateboard decks and jewelry to help her raise the money. 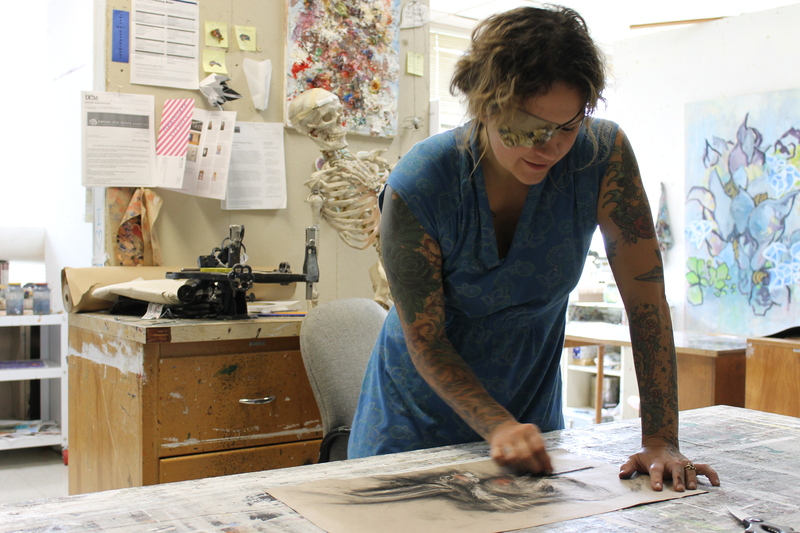 Gann is focused on finishing her degree and is also using the momentum from the Indiegogo site to help her art career. 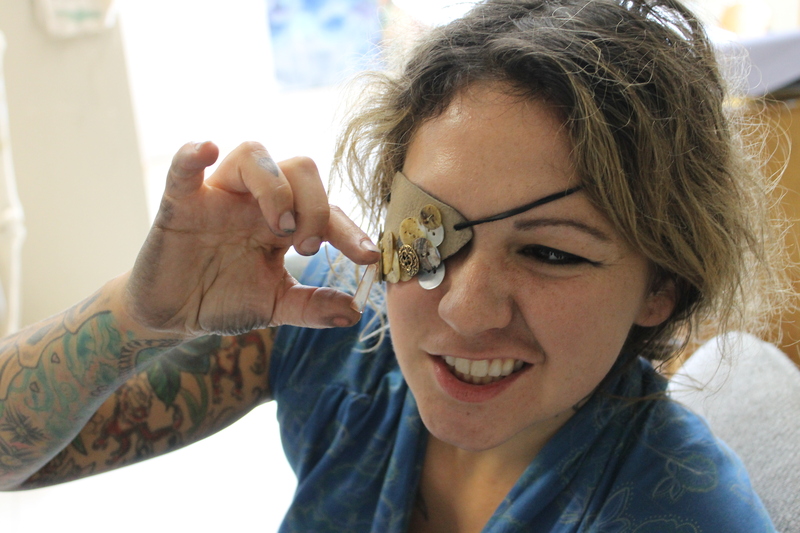 She and Moeller built a website where she can display her work, as well as sell some of her art and, of course, her eye patches. Visit an extended gallery of Gann’s work via her website here. Please tell me there is legal action being taken by this poor girl. I’m shocked by her lack of care!